Abstract: Universal humanity—the idea that human beings are, in some ways, all the same, possessing the same needs and rights—is the guiding principle of humanitarian action. Within postcolonial studies, this universalist philosophy has come under intense scrutiny for its Western bias and neglect of cultural and historical difference. This article explores the tension between humanitarian discourse and postcolonial theory through analysis of Bessie Head’s fiction, asking how we might envision a form of international community that avoids imperial power dynamics. 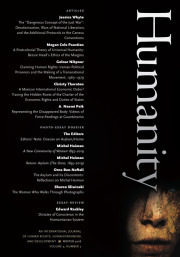 Head’s work critiques universal humanism for its links with Western arrogance, while also reimagining it as a legitimately inclusive foundation from which to confront global inequity. This content is restricted to site members. If you are an existing user, please login. New users may click here to subscribe. Megan Cole Paustian is assistant professor of English at North Central College, where she teaches writing and literature courses focused on issues of race, gender, empire, and globalization. She received her Ph.D. from Rutgers University, where she was a Jacob K. Javits Fellow (2008–12) and a Charlotte W. Newcombe Fellow (2010–13). She is currently at work on a book, Humanitarian Fictions: Narratives and Novels of the Third Sector, which explores the relationship between popular and literary narratives of international care, drawing humanitarian discourse into conversation with postcolonial critique. Her essays have appeared in Research in African Literatures and Safundi: The Journal of South African and American Studies.